October conjures up images of pumpkins, falling leaves and little children running around in costumes. It’s also the time for the inevitable transition from salads to soups, the pulling of comforters from storage, and for grabbing the hiking boots and tromping through orchards. And when one can’t get away from the urban jungle to feel the sensation of grabbing a perfectly ripe apple off a tree, you can thank the rising trend of artesinal apples for the variety that can be found at local farmer’s markets and specialty food stores. I have no magical combination that I use in my apple pies. Over the years I’ve explored the most local kinds for wherever I happen to be, and generally follow a combination of a 3-apple blend of sweet, tart and complex. Granny Smith and Golden Delicious are staples, depending on how delicious the particular bunch is. I also am a huge fan of Macoun, Northern Spy, Braeburn and Mutsu. I’m even a bigger fan of dozens of varieties I can’t recall, because they just tasted so good when I took that first bite. The best pies start with a little voodoo: enjoy the magic that is touching, smelling, tasting, and conjuring up ideas of how a combination will taste when baked into a crumbly crust. I par-bake the apples together while making the crust. This helps the spices infuse more thoroughly and then you don’t have to bake the crust so long, so it can be flakier and softer than ever. This crust recipe utilizes a unique blend of gluten-free flours – sweet rice, amaranth, quinoa and flaxseed. I tried these together for both health and flavor reasons, and was more pleased with this result than any other combination I’ve recently tried. The rice provides structure, the quinoa both protein and optimum digestibility, the amaranth sweetness and a slightly different texture, and the flax provide a nutty flavor and fiber. I swirl a tablespoon of blackstrap molasses over the par-baked apples to provide even more depth and complexity – an experiment of old that sent me over the full moon! Spread apples on 2 baking sheets, and sprinkle evenly with palm sugar, cinnamon and nutmeg. Bake apples for about 10 minutes in preheated oven, until just soft. Remove to cool slightly. While apples are cooking, prepare the crust. In a standing mixer with the paddle attachment place all crust ingredients, and use a fork or whisk to blend. Toss in butter. Start mixing on low, then medium/low, until the crust just pulls together. If too dry add ice-cold water, a tablespoon at a time and waiting until incorporated to continue adding. Try not to overmix – make sure the butter is incorporated but don’t go beyond that. Roll or press half of the crust into a deep-dish pie plate. Fill with all the apples, layering high. Drizzle entire tablespoon of blackstrap molasses on top. Roll out top crust, cover the apples, seal the edges and slice a few vents in the top. If desired, use a pastry brush to brush with water or melted butter, and sprinkle with palm sugar. Bake for approximately 30-40 minutes, being sure to cover the edges of the pie halfway through so they don’t brown. Notes: Gluten-free crusts can be hard to roll. I suggest rolling on a floured piece of parchment or wax paper, flipping the dough after a few rolls, and then using the paper to flip into the plate. Luckily they’re sturdier than traditional crusts, so you can easily refrigerate and roll again. The crust will crumble initially when cutting. Refrigerating the pie, slicing and reheating works out best. No matter how you slice it, it’s a delicious recipe. 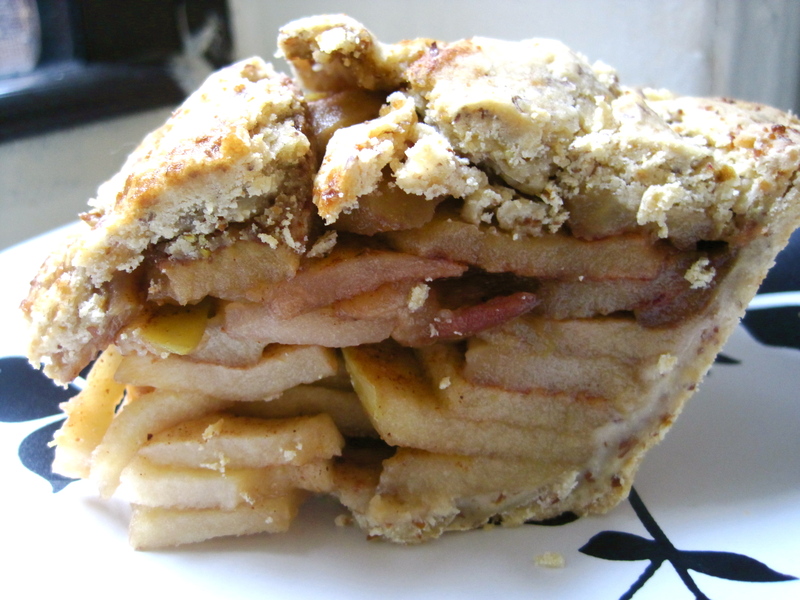 The crust is both nutty and sweet, and the flavor of the apples both complex and comfortable.